Trend Indicator Shows Bitcoin Price is All Set for a Bullish Run Ahead! In case you’re looking for some positive signs for the bitcoin price to jump again and retract from the sad state of affairs it’s currently into, then this technical analysis will give you hope. Divergence Analysis Inc.’s (DVAN) Buying and Selling Pressure Indicator now shows that there are good times lying ahead of the Bitcoin after the currency lost more than half its value this year. The DVAN indicator is a proprietary analysis which charts the coin’s current price, trend line and ideal exit points which now strongly indicate that the selling trend that began May 14 could end shortly, giving way to a potential bull run. Within that period, Bitcoin has plunged by 27 percent from $8,700 to $6,300. This period has been characterized by massive selloffs causing many experts to infer that BTC may be oversold. Historically, data show that when the stop and trend lines cross, the price of Bitcoin may see a reverse in trajectory. 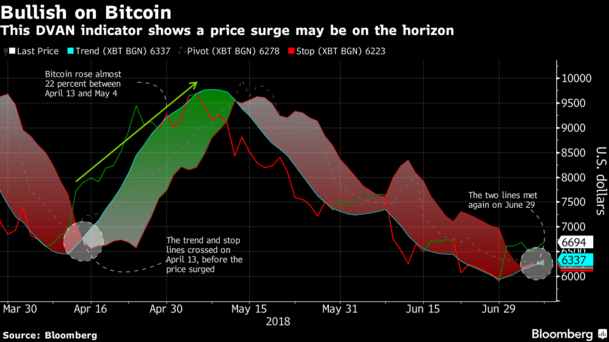 The last time these lines met on April 13, the price of the coin surged almost 22 percent to more than $9,600 on May 4 from $7,903. June was an especially low period for the highest ranked cryptocurrency based on market capitalization. In mid-June, BTC shed $1,000 from its value in less than a day. It also set two new 2018 lows before experiencing a slight recovery that began at the end of June, all the way into the first few days of July. On Friday, the trend line crossed the exit point again, and the cryptocurrency rose almost 2 percent to $6,693 as of 2:25 p.m. in New York on Monday.